In the meantime, great developers are delivering next generation experiences on top of new modern features that many browsers have implemented TODAY. The Web platform makes it very possible to progressively enhance (or regressively!) your application for the fast growing segment of the population that has a fantastic modern browser. Take a look at the demos from the IE9 beta event, Chrome Experiments, and Mozilla Hacks for a glimpse at what is coming. Users expectations of the Web are just about to be changed again. The day that you used Google Maps for the first time was the day that MapQuest seemed AWFUL. As soon as the bar is raised, you can’t go back. What side of the bar do you want to be on? Disclaimer: There are real tradeoffs with the Web platform being an open standard with multiple implementations. The platform is diverse and not always uniform. It is our job to rally browser vendors to fix things. For example, Microsoft is doing great things with IE9, but they need to add CSS3 transitions/transforms/animations as soon as physically possible. I would like to think that Philipe meant more to highlight the tradeoffs and not discourage developers. But man, the W3C can really drive me nuts. Remy Sharp has some nice ranty thoughts on the topic, too. This kind of thing underscores the reasons for the WHAT-WG split from the W3C. 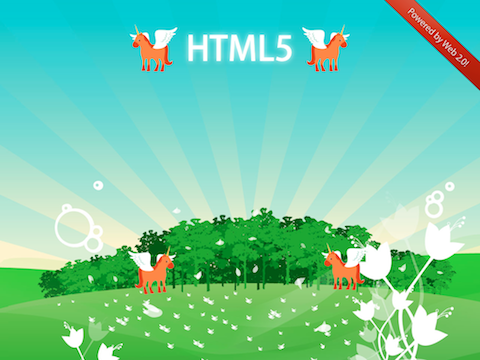 There was mysteriously no mention of mobile browsers – which are leading the charge in a lot of HTML5 respects. This immediately discounts his opinion. So, really, we should all do nothing unless Adobe Flash allows us to. web developers never looked at the recommendation level of a specification. As a developer, I don’t really care if HTML5 as a spec get an official stamp in 2015. All I care is, major browsers (which have > 80% market share combined) implement the HTML5 features – minor variations in implementations are acceptable. All web developers are used to IE workarounds. This is no different. As a user, I don’t even care that there exists something called HTML. All I care is, new websites are developed with features that previously were done only in native desktop apps and that they work on my browser. So except for browser makers, I guess this is a non-issue for everyone else. OT aside to John Welch: It’s not useful to assert things which are not so… cuts into others’ reading time, and the habit affects your own growth. Just wasteful overall… you can do better. The timing of Philipe’s comments, the venue on which he commented and the surrounding defense of his statements by Adobe and its employees makes me vomit. Political? You bet. Adobe knows that HTML5 will eventually render Flash useless for *most* of its current applications and will completely lose what I personally think it lost a long time ago: “cool factor”. Flash websites used to be “cool” hence Flash’s popularity and all its misuses. Now, HTML5 is the new “cool” (with just as many misuses, but of name not application this time). Farewell Adobe. May the Ballmer be with you.